Football season is well under way. The pre-season games have begun, facebook statuses are inundated with comments about this player and that team, and my man is preparing for his Fantasy Football leagues. Yes, plural. So whether I’m hosting a Fantasy Football event, having people over for Sunday Night Football, or going to someone else’s get together, it’s an opportunity for me to get crafty. I think in general, guys don’t really care about the presentation of food and drinks, even though I think that’s just as important as how it tastes! 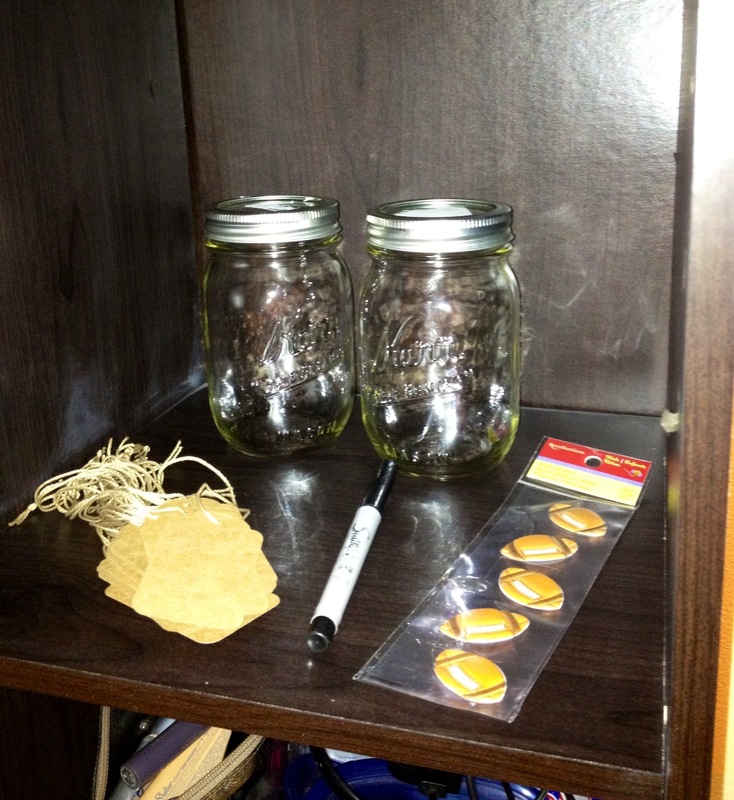 So, with that in mind, I suggest keeping your decorations and crafty creations low-key and simplistic. 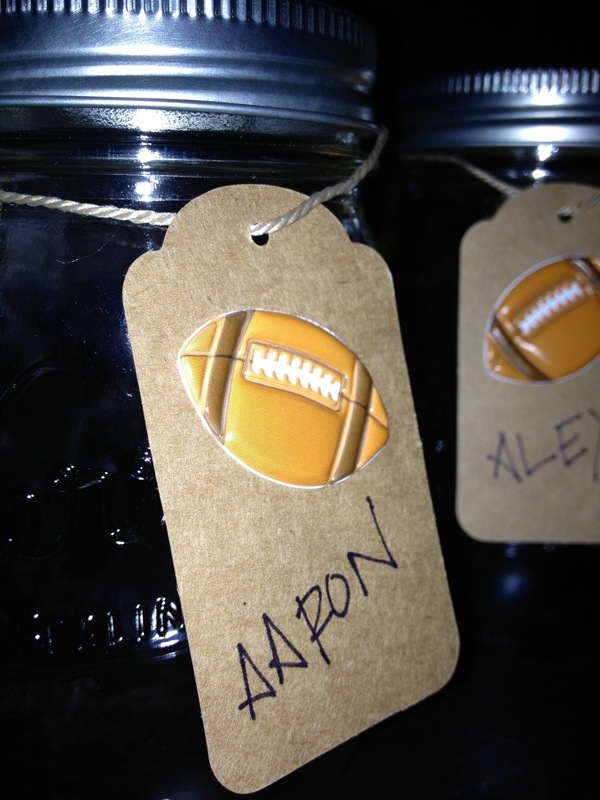 Today’s Fantasy Football Adult Beverage is perfect for football season. It’s a spiked apple cider, which I have dubbed “Mock Moonshine”; while it’s not the real deal (unfortunately I don’t have gallons of moonshine in my cellar just waiting to be enjoyed), it’s got the flair and look of authentic moonshine. I found a few different recipes online; they all sound delish! 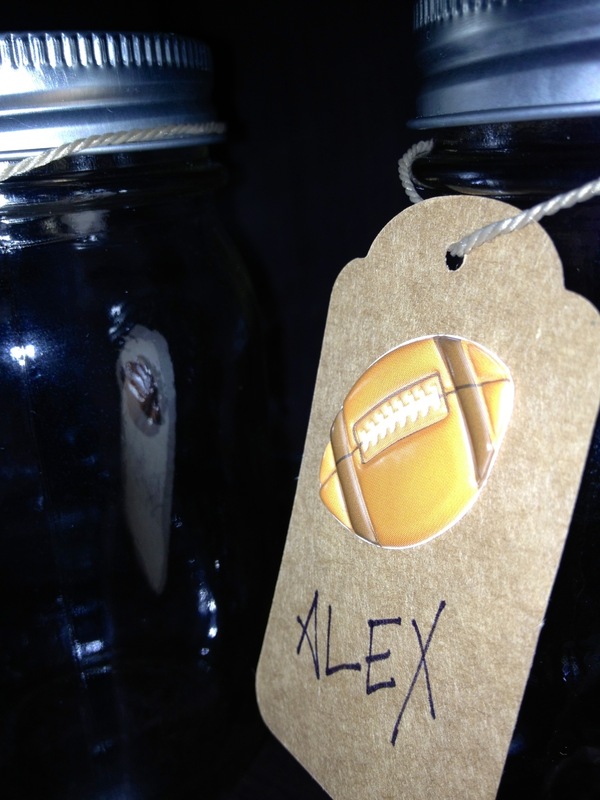 The Mocktail wouldn’t be complete without a fancy, football-themed container! It is simple and can be transformed into a theme, EASILY! 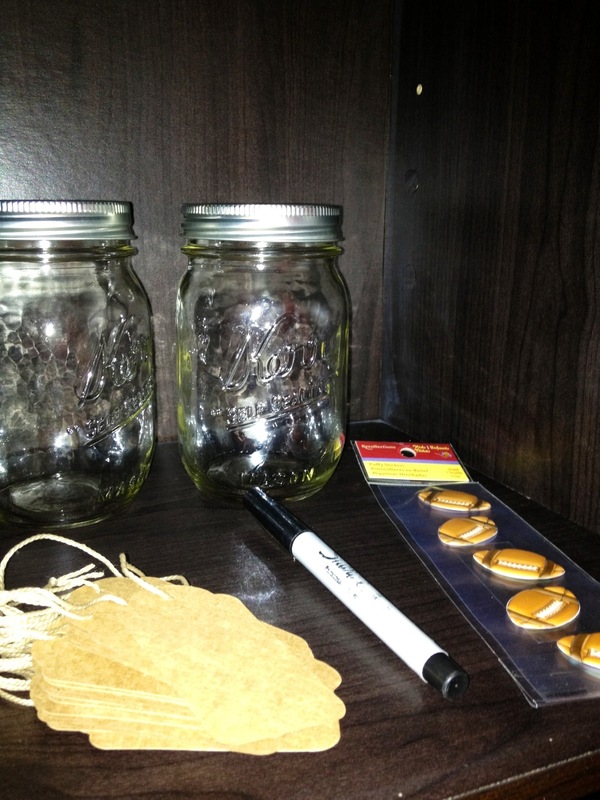 I chose to buy a few Mason Jars for the event. This DIY is super easy and fun. It adds a very “put together” presentation of a drink and the appearance. My nephew is a sports fanatic. If you let him, he would play outside all day long, non-stop. 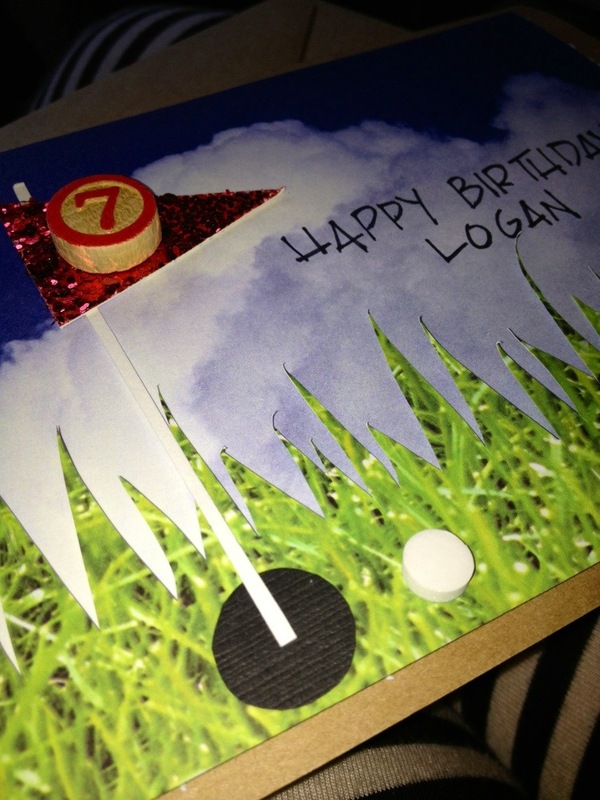 His most recent obsession is golf so I made that the theme for his card on his 7th birthday. Check out the YouTube clip to see the “making of the card”! I kept it simple and full of color. I used 5 different pieces of cardstock: green grass, blue clouds, bright white (pole), red glitter (flag), and black for the hole. On the backside of the green grass cardstock, I simply sketched quick “grassy” looking lines and cut along those lines to give it a realistic grass effect. 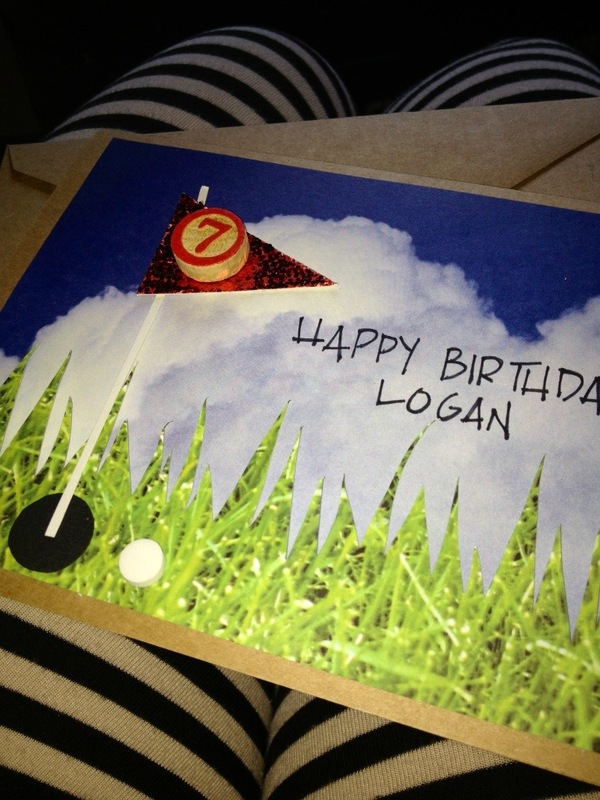 I placed the grass over a piece of blue clouds cardstock and then attached that to the actual card. The rest of the card was very simple. I cut out out a long rectangle as the pole, a small circle for the hole, and a glittery triangle for the flag. Finally, I added a fun little #7 to the flag and used my own handwriting for the message. Don’t forget to check us out on IG! The Easiest Wall Art You’ll Ever Make! I am not joking when I say this is the easiest wall art to DIY. I have dabbled with the whole canvas, spray paint, sticker letters, mod podge version of wall art. 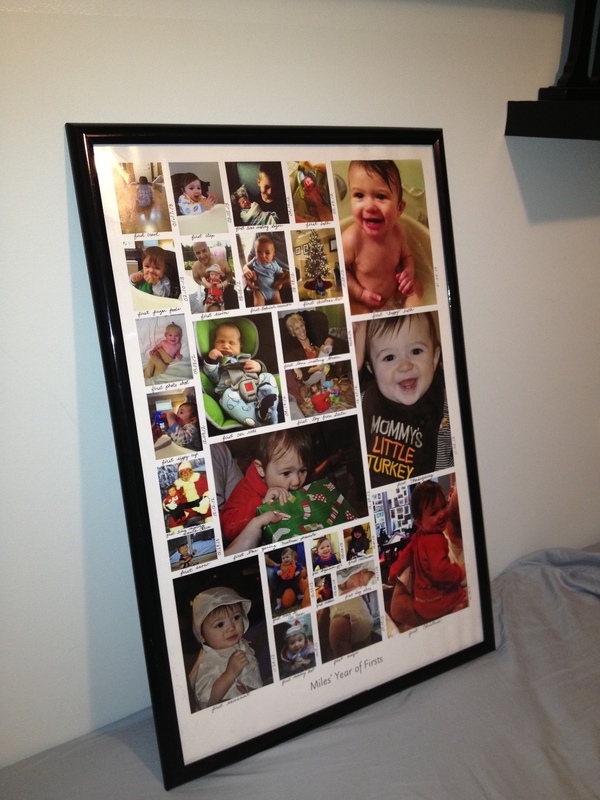 But, when you’re in a bind and you need a fast and personalized way to create some wall art, THIS is the way to go! Pick a quote or phrase to type onto a Word document. You’ll also decide which word you want to “stand out” with your 3D sticker letters. This project was for my nephew’s nursery. 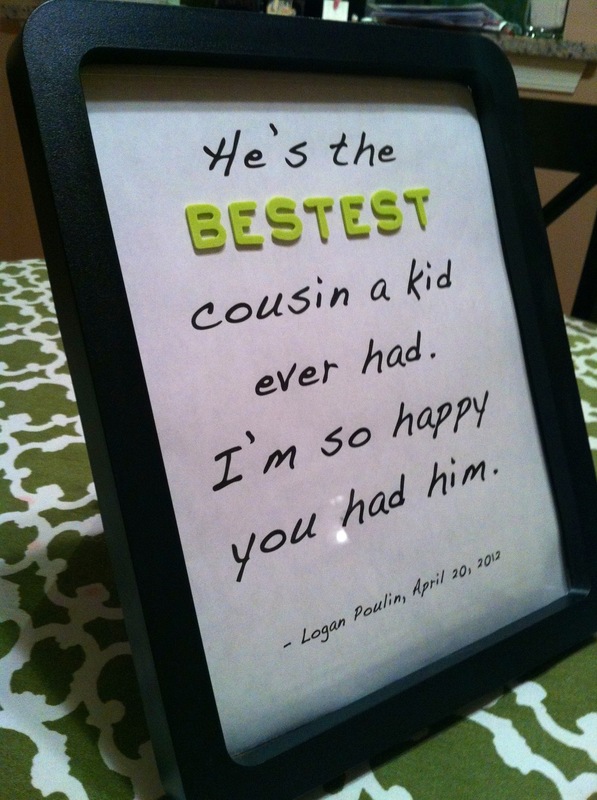 My other 7 year old nephew said this to my sister a few days after she had the baby; it was the cutest thing and I knew right away I wanted to do something with this quote! 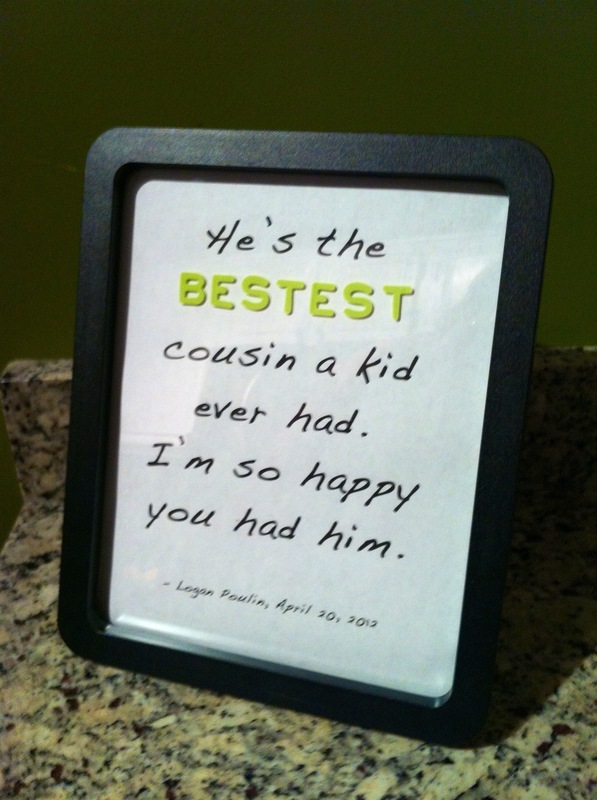 Print out the quote, attach the sticker letters and place into the frame. 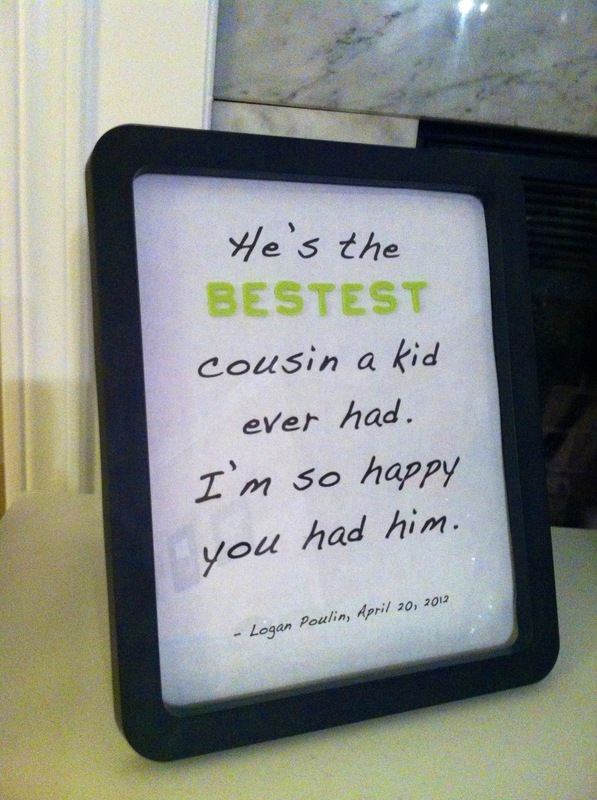 This is a great way to create a personalized gift for a baby or bridal shower. It’s inexpensive and truly requires no special skills. What would your wall art say?! 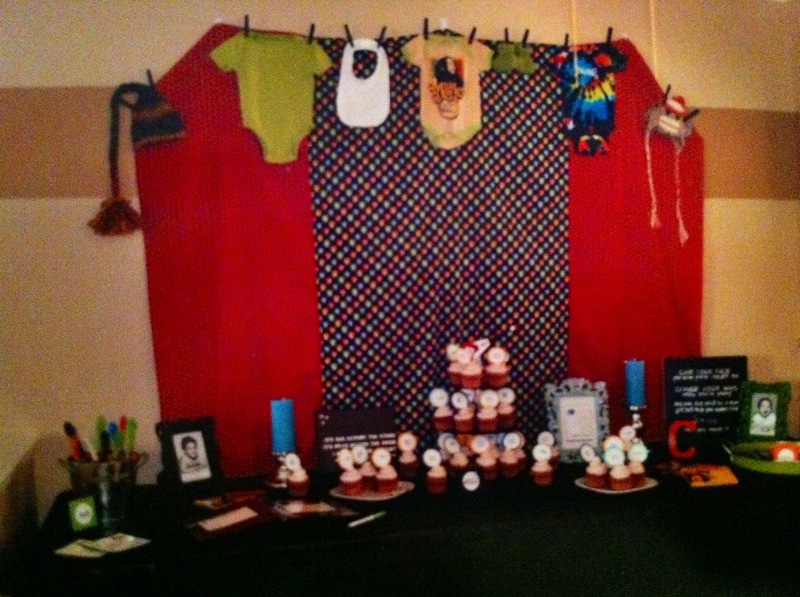 Hosting a baby shower for a friend or loved one can be overwhelming, exhausting, and expensive. You may have an idea of what you want the decorations to look like, what you want the food to be, how you want it to all turn out. Sometimes, these great expections get in the way of preparing a simple, yet memorable event. I think it’s definitely important to have inspiration, be it from Pinterest, an event you’ve been to before, or ideas you can pull from random blogs. 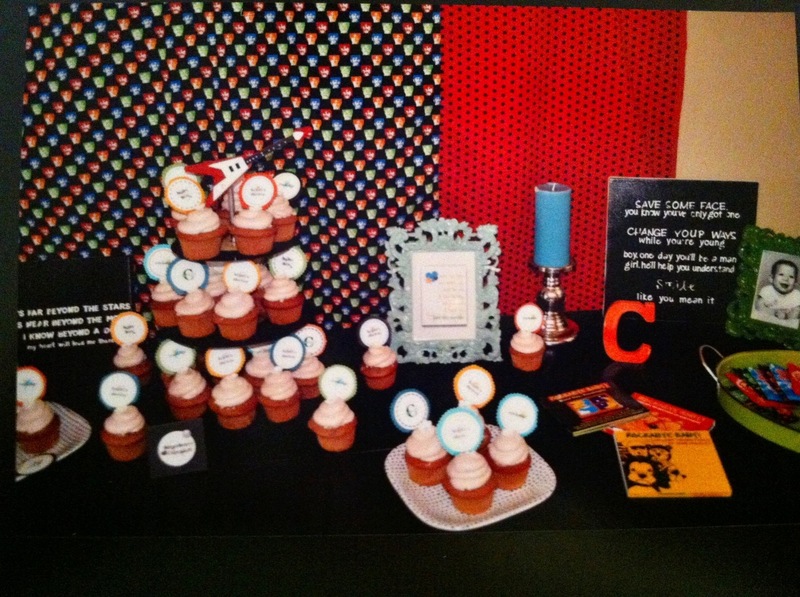 Last year, I was responsible for helping host a baby shower for my sister and her husband. They are both huge fans of rock music from the 70’s, very laid-back, and I would consider them non-traditional. It was decided it would be more fun to make the decorations; ALL OF THEM. Unfortunately I didn’t get any of step-by-step photos of the decorations I made, but they are SO simple, a quick explanation should be sufficient if you want to duplicate. The theme was “Shake, Rattle, and Roll”! I am, by no means, an expert sewer; I’m not even somewhat proficient. The idea of creating your very own backdrop may seem intimidating, but there are a couple of ways to do it, that don’t require sewing. By making your own backdrop, you can pick specific fabrics and patterns to go along with your theme. The center pattern was an Andy Warhol inspired pattern of the members of the Beatles. The outside panels were red with black polka dots. I simply hand sewed the backdrop together, but you could also get a fusing material to iron on to the fabric and attach the materials together. 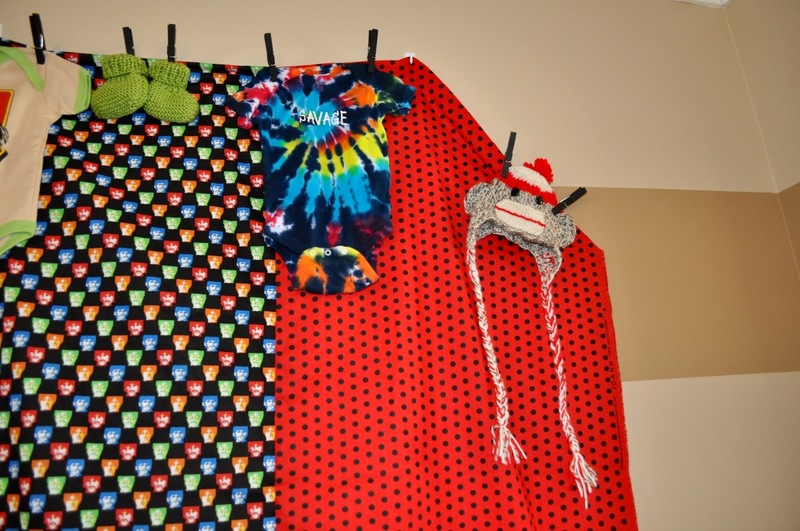 Then, we gathered different styled onesies, socks, knitted hats, etc. My mom knit a pair of green socks and a couple hats and I ironed letters onto a tie dye onesie to complete a backdrop. Another aspect of the main table was a DIY canvas with song lyrics. This idea was taken from Pinterest. 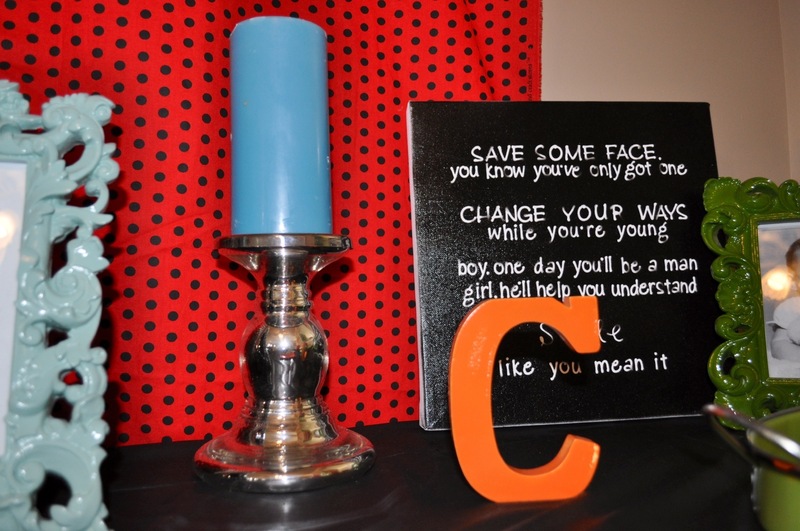 On a blank canvas, place your lyrics or phrase of sticker letters onto the canvas. Spray paint over the letters and let dry. Finish the canvas with mod podge to give it a finished, glossy look. The letter “C” represents the last name. This literally took me 5 minutes! The wooden letter, purchased from Michael’s, was simply spray painted and place in a safe area to dry. The candle gives the table a chic rock n roll vibe. Although a ton of colors were used, they worked perfectly together. 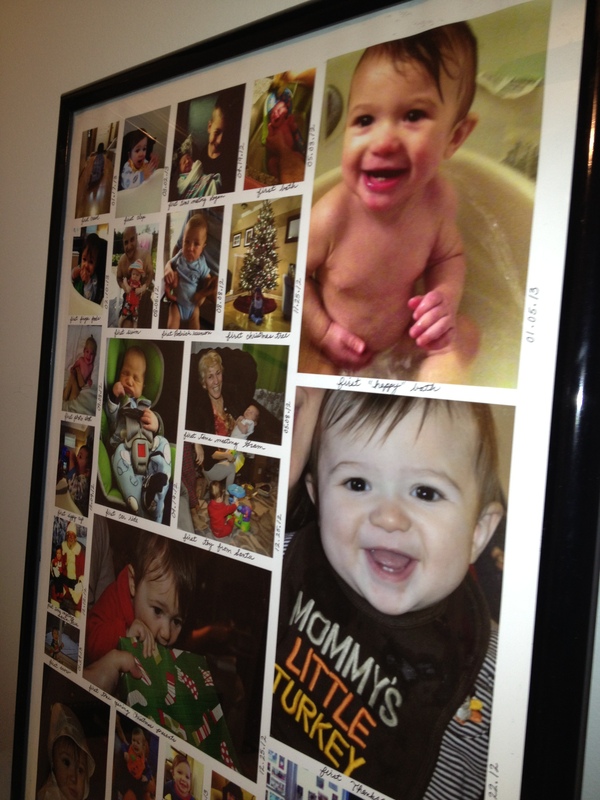 This frame, along with a black one and a lime green one, were purchased from TJ Maxx for less than $10 each. They are ornate, yet work really well with the whole theme. 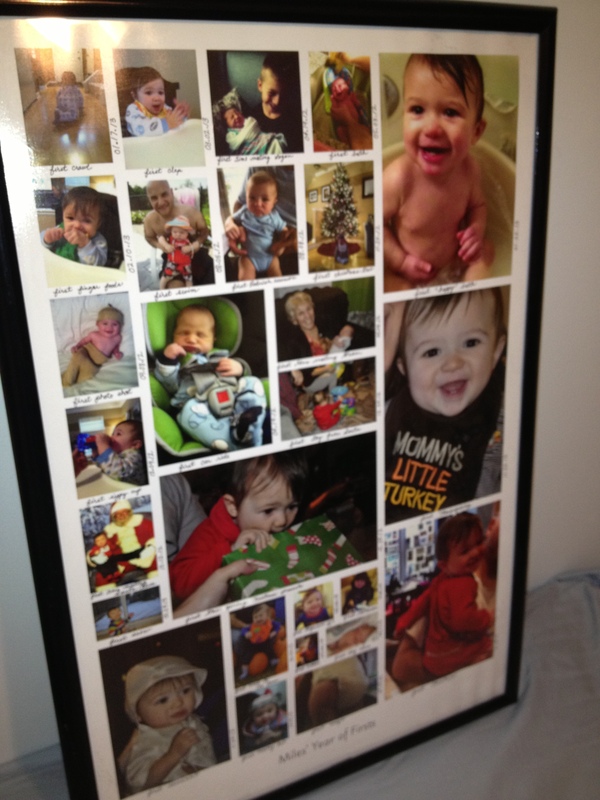 Inside the frame is song lyrics from one of the parents-to-be favorite songs. I simply printed them off a computer and cropped the paper to put inside the frame. It is a very cool, simple, and different decoration. 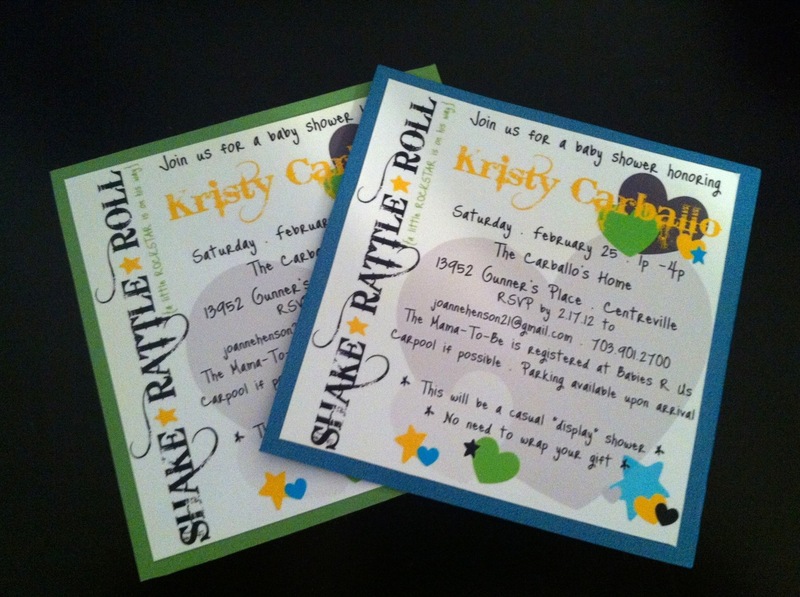 These DIY invitations were inspired by a couple different of themes and pictures I found on Pinterest and Etsy. I used Microsoft Word and printed them onto glossy photo paper. Then, I cropped them and attached to a piece of cardstock. My favorite part of the shower was the DIY cupcake stand made by my very talented, very retired, and apparently very bored stepfather. He literally bought old vinyl records to be the 3 tiers of the stand. Then, he crafted the guitar using pieces of wood and painting it. It still blows my mind he created this; always look to family and close friends as creative resources. He by no means is a cupcake stand builder; but he knows how to use handyman tools so he was a huge help in all of this and blew all of us away! 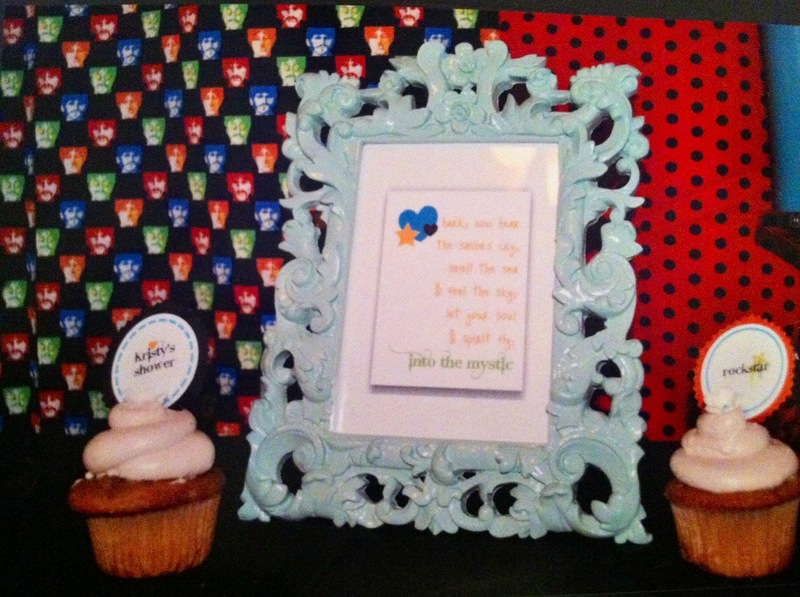 The cupcake toppers were created again, using Microsoft Word and printed onto glossy photo paper. They were cut out and attached to cardstock. The cardstock was attached to lollipop sticks purchased from Michael’s. Make a list for everything! I literally bought a journal to write all my brainstorming ideas, things I needed to buy, ideas I thought were lame but wrote down anyway. It kept everything in one place and was a great resource for me throughout the planning process. Create a budget and stick to it. Although a baby shower is a monumental event, it shouldn’t put a dent in your wallet. I recommend creating a table with decorations as the focus, rather than decorating an entire huge area. It keeps the budget low and reasonable! Print out pictures for inspiration. Pinterest and Google Images should be your best friend. Print out pics and put them inside your journal for inspiration! Keep it simple. Take it from me, it is very easy to get caught up in making this event, the grandest, most fabulous, most fantastic baby shower ever. Get real. Less is more. This goes back to having one focus area and keeping the rest of your space very simple! Cater to the needs/wants of the person(s) being honored. 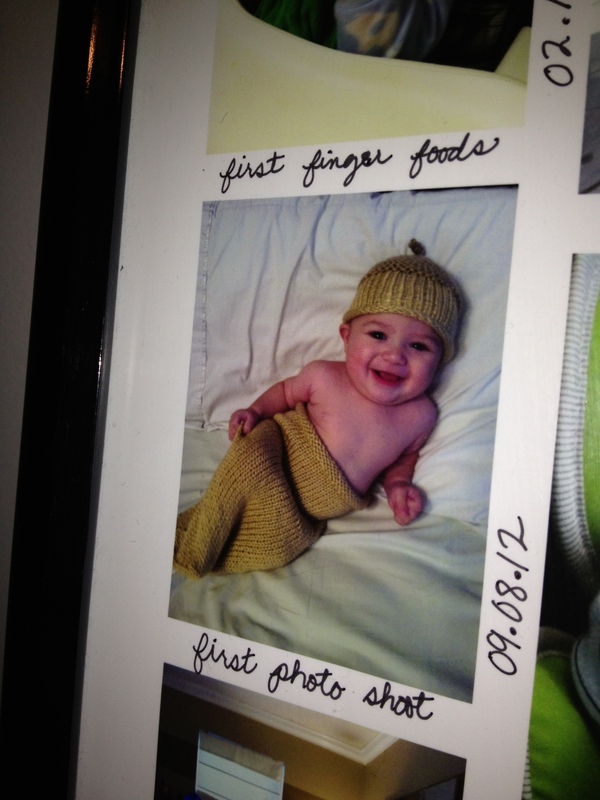 I realized right away that what I wanted, wasn’t necessarily what the parents-to-be wanted. 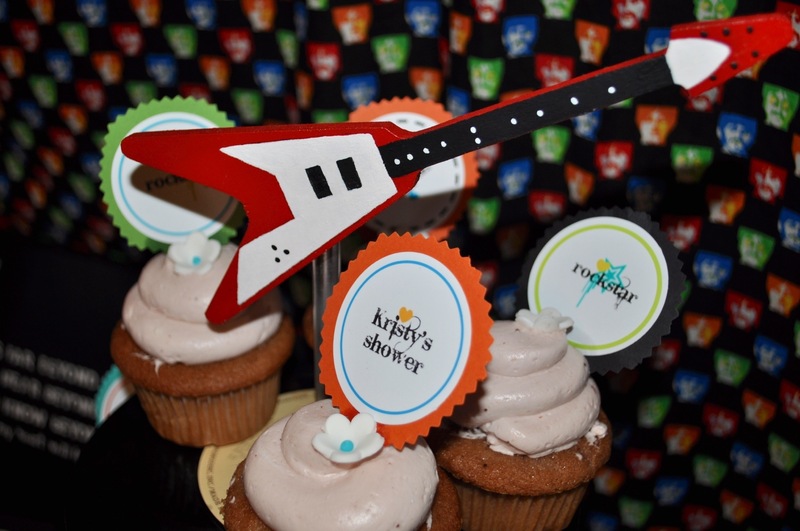 At the end of the day, if they don’t want a cupcake stand made out of records and a guitar, just don’t do it. I didn’t think it was possible to make onesies any cuter, but I’m here to tell you it is! 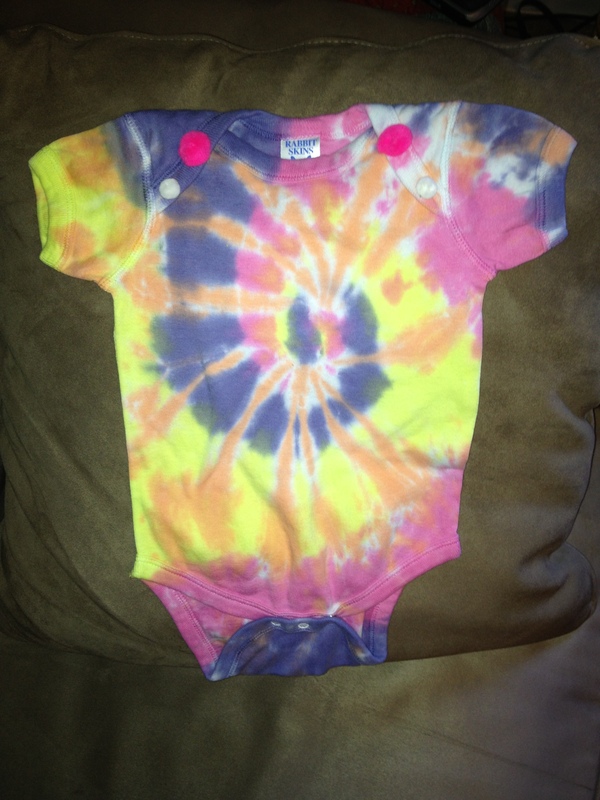 Last week, Kristin jazzed up a onesie using a patterned fabric and a sewing machine. 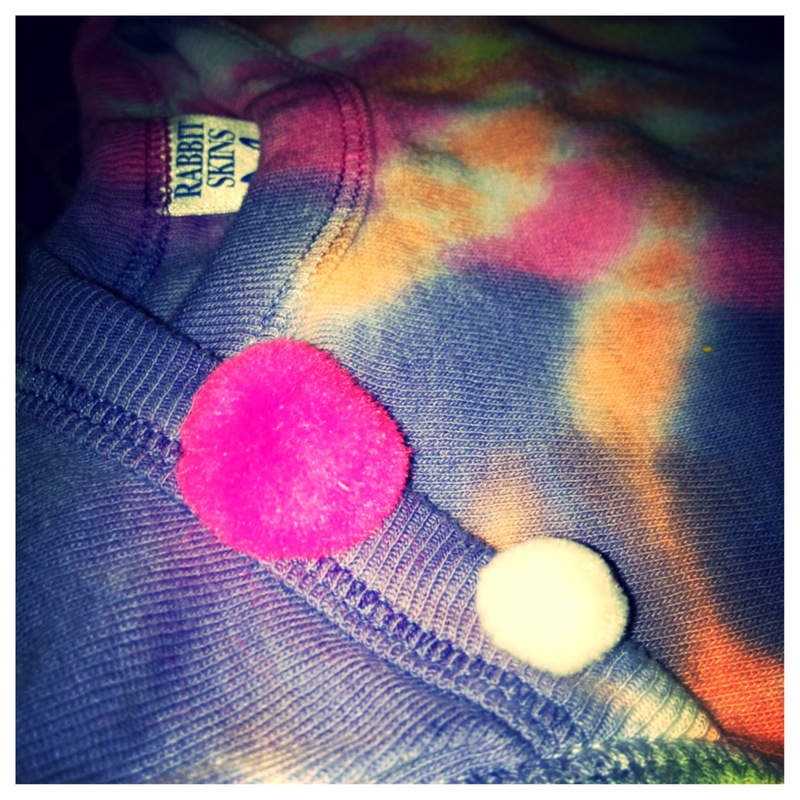 This week, I’ll show you how to jazz up a onesie using little pom pom balls and a needle and thread. I recommend washing the onesie in baby safe detergent prior to giving it away as a gift. Pick out the colored pom pom balls you want to use. 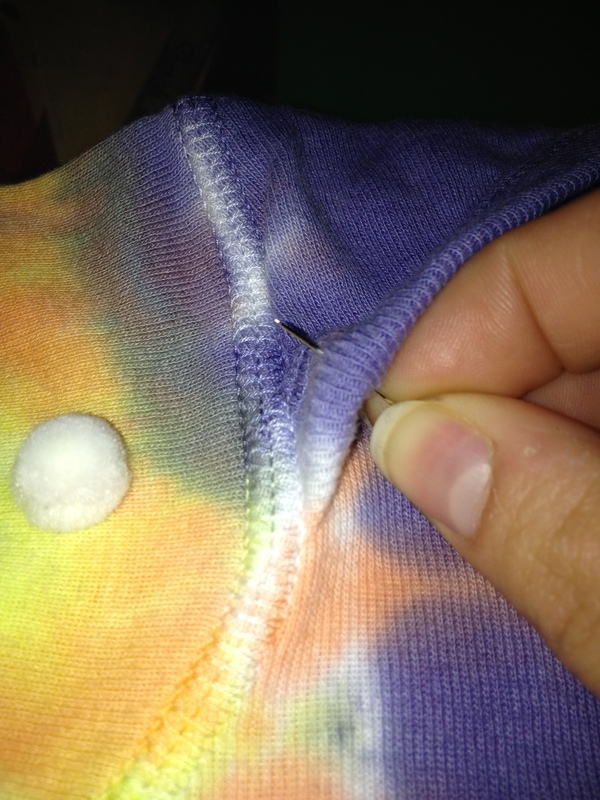 Thread your needle by placing one end of thread through the eye of the needle (the hole). Pull the thread through for about 6-8 inches of thread. 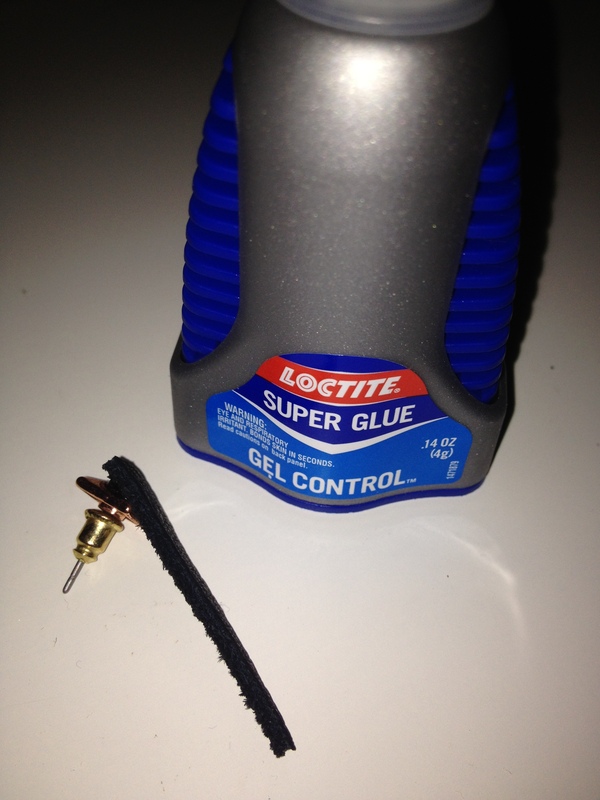 Cut thread and tie the ends together in a knot. 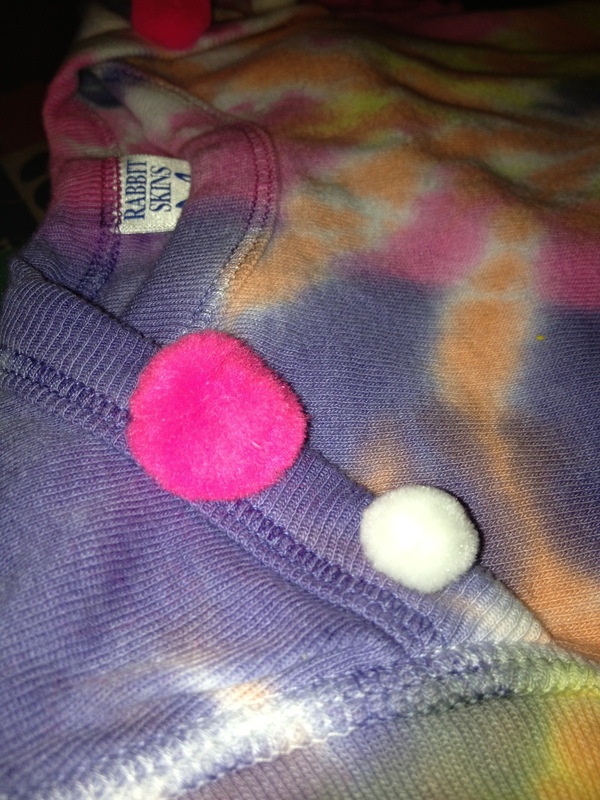 I chose to place the pom pom balls near the neckline of the onesie. I see it as the baby version of studs or spikes on a woman’s blouse. 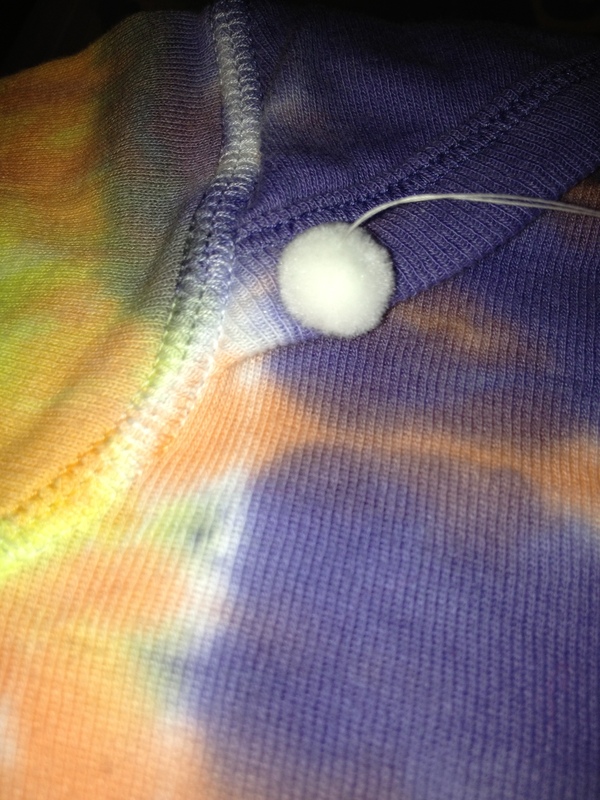 Starting INSIDE the onesie, push the needle through the material and then through the center of the ball and pull firmly. Then, take the needle and push back through the center of the ball and through the material again. Repeat this process several times until the ball is securely attached to the onesie. 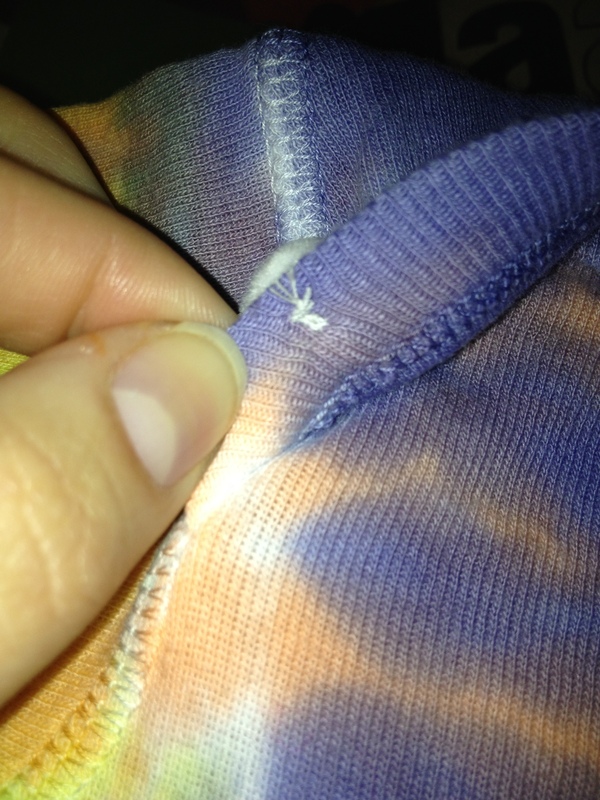 You should secure the thread on the inside of the material by knotting the ends as close to the fabric as possible. 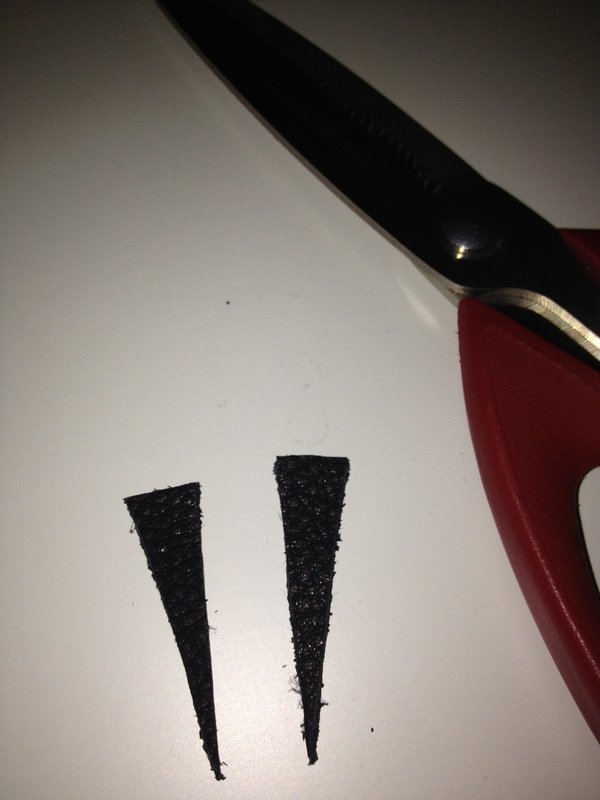 Trim the ends of the any loosely hanging threads. 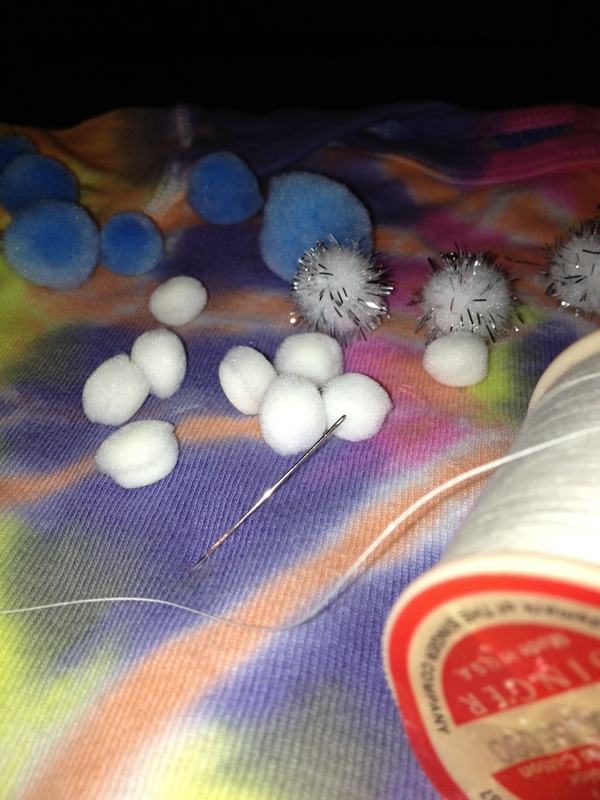 Repeat this process for the other pom pom balls. This is very simple for those who don’t have the patience to learn how to use a sewing machine (ME). 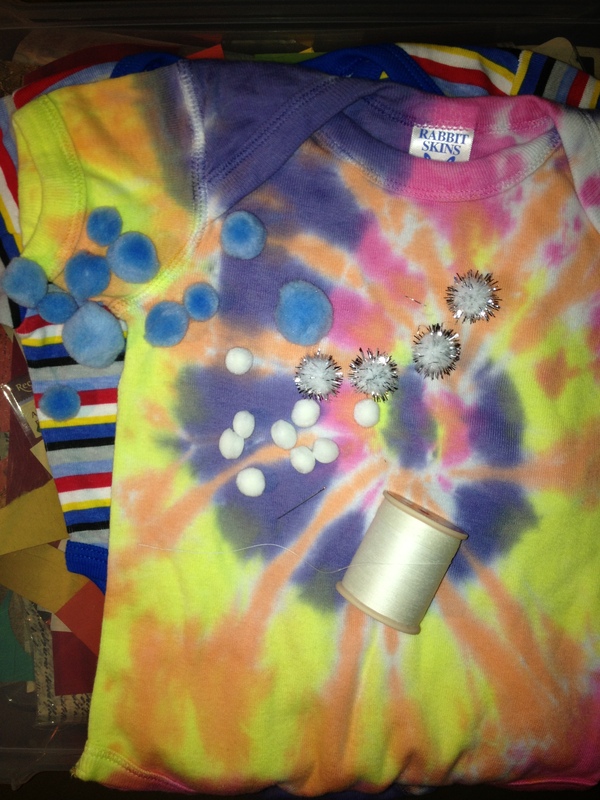 Another idea is outlining the shape of a heart with buttons or pom pom balls. I wanted to make something with the leftover leather I had from the Urban Outfitters inspired necklace I made a few weeks ago. 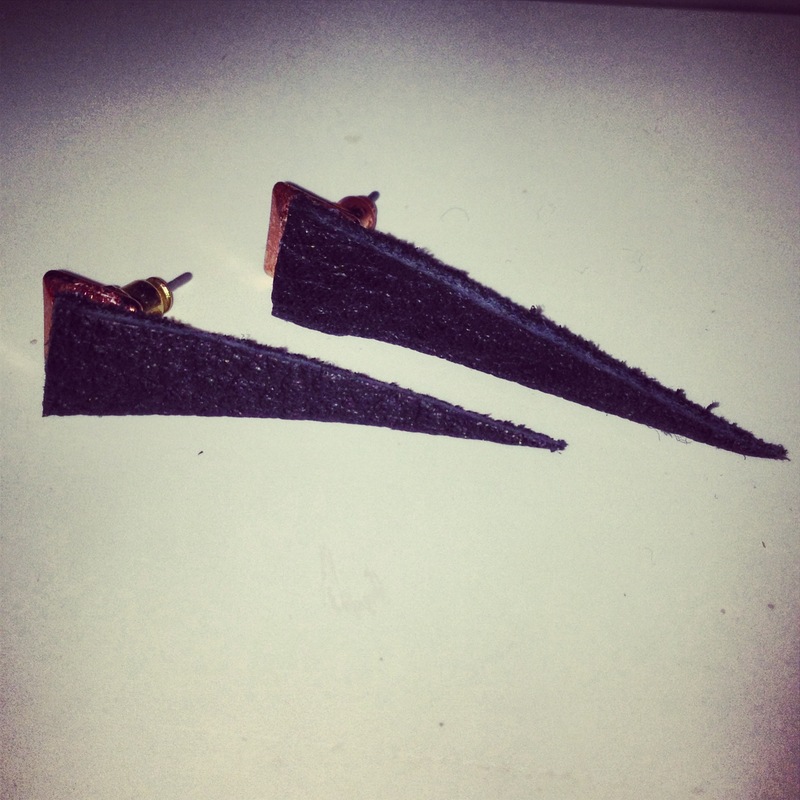 I decided to make a cute pair of simple, funky earrings that are sleek enough to wear to work, but cool enough to wear out on the weekend. Cut out your desired shape in the leather. 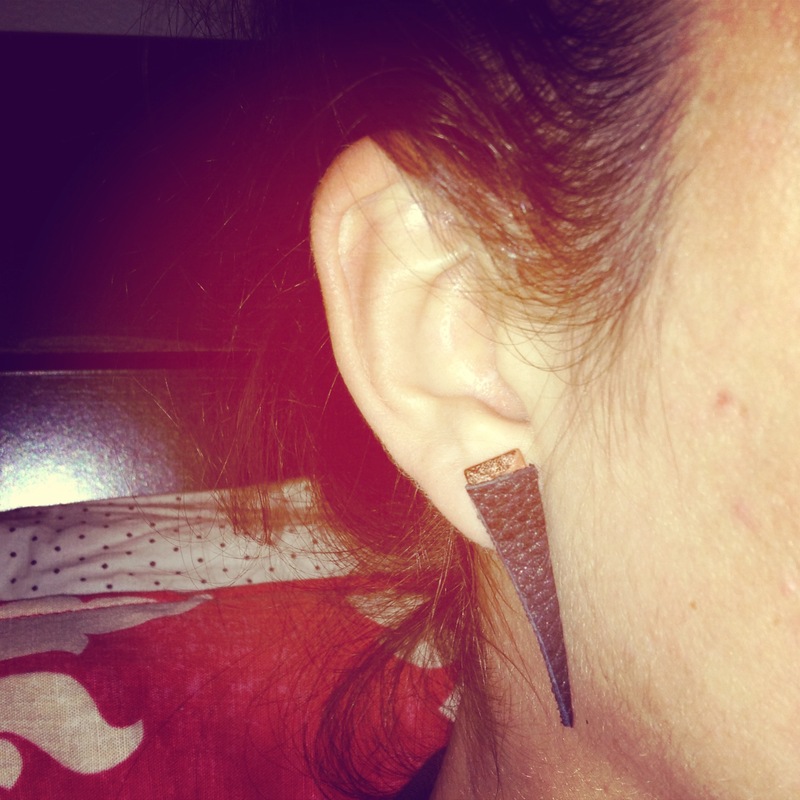 I chose a long, thin triangular shape. You could do an oval, square, rectangle, etc. 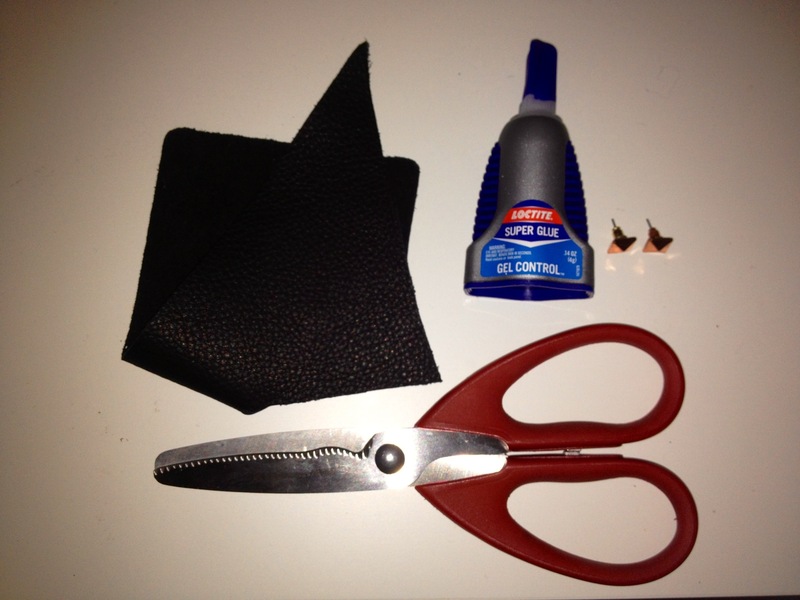 Next, simply apply a fair amount of super glue onto the stud earring and firmly attach the leather pieces onto the stud. Let dry for several hours. I love how they turned out and they literally took me 5 minutes to make. I can’t wait to see what I come up with next using that same $5.99 piece of leather!